Since Easter is tomorrow, I wanted to do a post today and tomorrow. Today’s will be contemporary Easter in films complete with dying eggs, Easter bunnies and large bonnets. Tomorrow’s post will focus on the religious and Biblical aspect of the holiday. 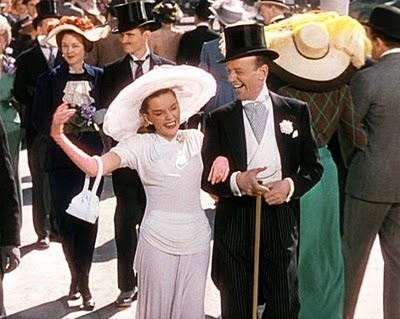 Easter Parade (1948): Who saw that coming? This is probably the only feature film that isn’t set in Biblical times that prominately features Easter throughout the movie. Though the movie really isn’t about Easter and its importance, it begins and ends with the holiday and the prominance of being featured in the newspaper while walking in the “Easter parade” in one’s Sunday best. The actual film is about show business and how back stabbing dance partners can be when you are trying to hit it big with the Ziegfeld Follies. This is a great favorite at my house. It has a wonderful cast, several funny scenes and one of the best musical soundtracks you can find. Below is a clip from the beginning of the movie featuring the songs “Happy Easter” and “Drum Crazy.” Unfortunately, Youtube didn’t have the famous “Easter Parade” scene at the end. My Dream Is Yours (1949): You may think: What? Isn’t this a Lee Bowman-Jack Carson-Doris Day remake of “Twenty Million Sweethearts”? Why yes, yes it is, but there is a VERY humorous scene where Doris Day’s son, Freddie has a dream the night before Easter. Doris and her soon to be boyfriend Jack Carson are dressed up like Easter bunnies and singing and dancing with Bugs Bunny. I really like this movie, Doris looks beautiful and the plot is a bit more serious than “Twenty Million Sweethearts.” However, singing like Easter rabbits is a bit silly. Before the dream, Freddie and Doris also dye Easter eggs, and that’s about all there is to the Easter references. •What Price Hollywood (1932): In this “A Star Is Born” take off, I think Constance Bennett’s husband either tries to commit suicide or dies on Easter, but I don’t remember clearly. •Holiday Inn (1942): This should come as no surprise. Bing sings Irving Berlin’s “Easter Parade” song in the film that features every other holiday under the sun. •Peyton Place (1957): I think Allison goes to pick up Selena for Easter service, and Selena’s step-father was trying to make a move on her. It’s disheartening that Easter is in so few films. I know Lent isn’t as exciting a holiday season as Advent, but Easter is a much more important holiday than Christmas. We will explore this more tomorrow in the Biblical representation of Easter in films. This entry was posted in Holidays and tagged Doris Day, Easter, Easter Parade, fred astaire, Holiday Inn, judy garland, My Dream is Yours, Peyton Place, What Price Hollywood by Jnpickens. Bookmark the permalink. It’s surprising, actually, that for the most part Hollywood hasn’t latched on to the potential of Easter movies. But judging from the negative reviews I’ve heard about “Hop” that might be a good thing! oooo Thanks! I’m exited 🙂 I’ll go check it out now!